“The weather does not look suitable for crossing a steep 12,800+ foot pass. I should remember the quotation from Desert Solitaire ‘when traces of blood begin to mark your trail you’ll see something, maybe’"
The date was September 20, 1985, and I was lying in my tent looking out at falling snow when I wrote the above in my journal. It was the 114th day of my Continental Divide Trail hike and I was reading Desert Solitaire for the first time. The book was having a big impact on me, as it has continued to do. 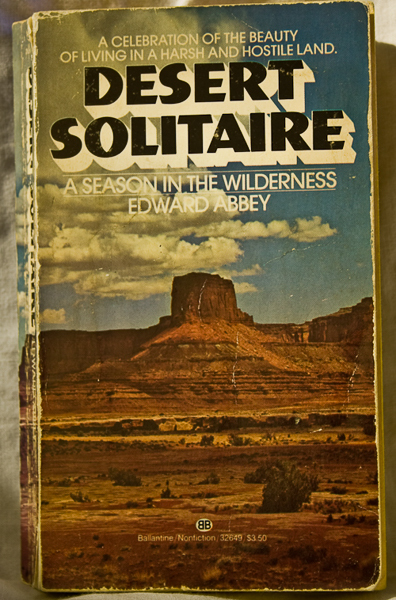 I’d never heard of Edward Abbey or Desert Solitaire until earlier in the same walk when it was recommended by Scott Steiner, my companion for the first 500 miles who I’d met three years earlier on the Pacific Crest Trail. I’d been looking out for the book ever since, finally finding a copy in the mountain resort of Copper Mountain in the Colorado Rockies. Now just three days later I was using Abbey’s words to get me out of my comfortable camp and up and over South Halfmoon Pass. It worked and with a stout stick for support – this was before the days of trekking poles – I crossed the pass in continuing snow and slithered down the steep, slippery, far side. That evening I was back in the tent reading more of Desert Solitaire. Since then I’ve read this fierce paean to wilderness and freedom many times. It never pales. Abbey’s words always ring true. I think it’s as relevant now as it ever was, perhaps more so. Desert Solitaire is a hard, rough book about the desert lands of the American Southwest but it’s also a book about the universality of the need for wilderness, nature and liberty and an attack on urbanisation and tameness. The writing is lucid, beguiling, provoking, passionate. Abbey wants to make you think and by god he does. This is not a book you can read lightly. This year is the 50th anniversary of Desert Solitaire, a good excuse to read it again, not that one is ever needed. My old copy is quite battered now but should withstand being read a few more times. Even so I think I’ll replace it in May when an anniversary edition with an introduction by Robert Macfarlane is being published. In the first draft of this piece I finished with some favourite quotes from the book. But out of context they don’t really work, fine though they are. The book needs to be read as a whole. So no more quotes – read the book!